i love this game i think it is so educational. i love our country so anything involving or learning more about it is right up my alley. i think it would be a great fun way for younger kids to learn about the country, attractions or wildlife. this is lots of fun for young and old, and isn’t as competitive as other games. a great way to have fun and entertain guests while learning. + great way to learn about your own country, or for overseas travellers to learn more about our country and possibly prepare themselves for a visit. very entertaing, a great gift for a friend from overseas. Great, great fun to play with as you learn a lot of important things about Australia. All agreed it is a good game, very tricky as some of the questions on the cards try and trick you with pictures that don’t gell with the answers, but you soon learn to watch out for those ones, I liked the way the game really made you think hard and look for clues around the board. Top game, one of the best, bet ter than some of the big name games. + The first time I played this game was at school last year, four of us year 12’s played the game it was great fun and at first we thought it was too easy, but then we discovered that with some very clever travel strategies we could make the game as tricky as we liked, we played it all afternoon with other kids and now we know lot’s of stuff about Australia, we will get our dads to buy one and test out our parents, that should be really good because dad thinks he knows everything. The family play this game every week as it can remind them of all the places we went to while we were in Australia, so many fantastic things we did and places we had so much fun doing things, like walking into waterfalls along trails where we saw wildlife, you would not expect to see close to big cities, these animals pop up in the game and that makes it even more fun. We thought the game was too cheap for the price we paid, only 20 pounds. An unbelievable game, all our friends in England love it. + I have just returned to England from a great holiday in Australia, my family visited Cairns and the Gold Coast then Sydney, we went to a Dymocks store in George Street and to our surprise found this game. It is great!!! Top game, I know 4 other people that will buy this game because it is excellent. Australia has never really had a board game to call it’s own, well this one is unreal, we’ve paid more for games that are nowhere near the quality of this one, so who ever came up with this one has really done a great job, the world will love it! + It’s brilliant, at last we have found a really great Aussie game. I saw this game advertised on TV last week and got one at Toyworld. When we opened the box the board was huge and the playing cards were so interesting, the kids were looking at them, then we had a game, then another game, the family had so much fun we are taking it with us in the caravan so we can play it with all our friends at our camp spot. – So far we can not find anything wrong with it, the kids have already made some new cards they got from the website address on the back of the box. Buy it, you will be really surprised how much you can learn, this is fun to play with a group as we did, I love the way the game is played as everyone has a chance to win the game. You can buy the game at TOYWORLD in Cairns, it only cost $49.99 I was so impressed with it, I bought two and sent one to my Mum in England. If you have never played this game, do it!!! + It’s an incredible game. I played this game in a Cairns Backpackers, everyone had fun with it, congratulations to the inventors, I will spread the word as I Travel Australia. 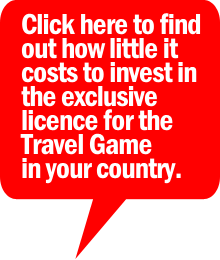 I had played a few travel type games before but the Travel Australia Game was great because you can download new cards FREE from the companies website,Now that’s a first. The other good thing is playing your game online with a friend back home by email and I thought having the rules books in other languages was innovative. The inventors really thought of everything with this game. Congratulation s!! well done. + Sensational!! I bought this game because a friend told me it was a fun game and great if you want to learn about Australia. I liked the honesty in the questions… no silly childish cards about animal parts or past politicians.This game is a world class product, I am so impressed with the quality and presentation I posted two back to Spain. My nieces and nephews will love it as they want to come out to Australia.